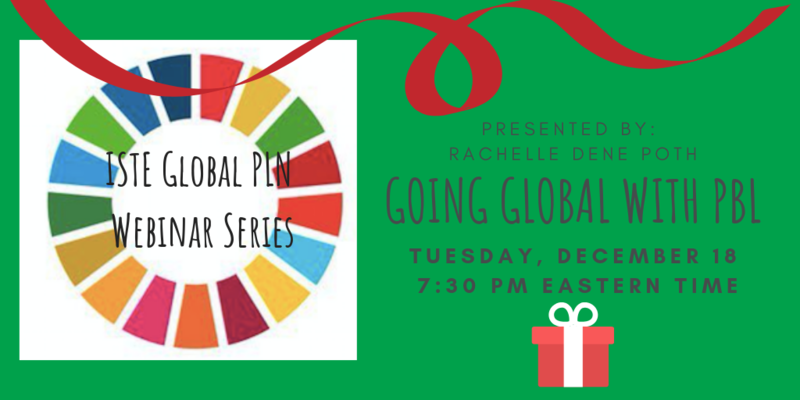 About this webinar: Rachelle Dene Poth will take us on a journey to go global with Project Based Learning. She will show how project-based learning provides opportunities for students to connect globally and the benefits for student learning, by having access to authentic and real-world learning experiences that will prepare them for the future. Learn how to get started, how to connect, the challenges that may arise and where to find the best resources. See student projects and hear how these connections led to deeper learning and more student engagement. Through PBL we empower students to become more aware of real-world problems, make global connections, teach about the SDGs and understand the power and benefits of using technology to connect with other students, educators and even experts in the field. Login: Once you register, you will receive an email with a url for the webinar. Copy and paste the url into your browser, and follow the prompts. You will enter the meeting room online.